Ray Borg is gearing up for a fight but this time it’s not inside the Octagon. The top five-ranked UFC flyweight revealed to FOX Sports that he’s currently engaged in a legal battle with his former coach/manager after he severed ties with him just recently. According to Borg, he previously worked with coaches at Fit NHB, a New Mexico based team and facility, before leaving to begin training under coaches Greg Jackson and Mike Winkeljohn at their gym in nearby Albuquerque. Borg says that his exit from the gym has left him in turmoil with his former team, particularly his head coach. Borg says that Vaughn was not only his coach but also signed him to a management deal when he first began working at the gym. He attempted to put an end to that relationship as well, but it has now resulted in a legal battle between Borg and his former coach. “I thought I was doing it properly because Tom had me under a management contract so he was not only my manager but he was also my coach,” Borg said. “I signed that contract when I was 20 years old. I had no idea what I was getting myself into. I trusted in them. Borg says as much as any potential lawsuit might hurt his bank account, he was more upset by his former coach making the split more about money than the relationship they shared for several years. “It was very, very disappointing. … Jon Judy and Arlene [Sanchez], I owe a lot to them. Jon Judy looked after me but what disappointed me the most with Tom Vaughn, I thought he was more than just a business partner or business manager. I thought of him as family,” Borg said. “I didn’t have much of my real dad in my life. I grew up struggling, so I kind of looked at him as that father figure type. And I know it’s never easy when one of your athletes that you helped bring up wants to leave, but I wanted to do it out of the better interests of my career and what I thought was going to better me in the long run. Vaughn did not return messages from FOX Sports to comment on the pending lawsuit but previously commented about the alleged breach of contract when speaking to the Albuquerque Journal last year. According to lawsuit, Vaughn believes he’s entitled to 20-percent of Borg’s future earnings through August 2019, which was the extent of his management contract. 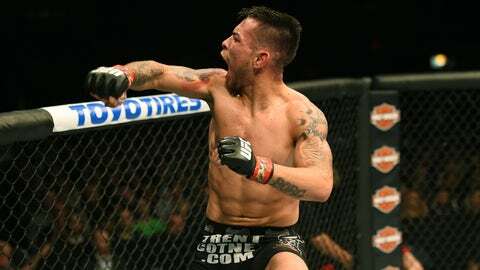 ?Ray Borg is in breach of his fighter contract with Wildbunch Management LL, money is owed, and we intend to collect,? Vaughn said. ?Ray can say whatever he wants but that?s why contracts are created.? Borg says he’s now preparing for a fight in court with his former coach and manager over the disagreement about their split. After spending most of his career with Vaughn and the coaches at Fit NHB, Borg hopes that one day they’d be able to put all this behind them and rekindle whatever friendship they once had, but he’s not counting on it. “I really do hope this all blows over,” Borg said. “Obviously it’s not going to blow over in the next couple of years but maybe down the road we could shake hands again.